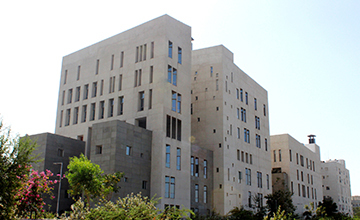 The INFLIBNET Centre moved from its premises in Gujarat University Campus to its new Institutional Building constructed at Infocity, Gandhinagar in January 2013. The new building, located amidst reputed institutions such as NID, DAIICT and NIFT, is constructed on the land measuring 10,000 Sq. Mtrs. allotted to the Centre by the Government of Gujarat, free-of-cost. The building of the Centre is designed by internationally acclaimed architect and renowned academician Dr Balkrishna V Doshi of Vastu-Shilpa in consultation with other experts in the field of sustainable, eco-friendly and energy-efficient building. Services of M/s. Katira Construction and M/s Malani Contractors, civil contractors, were hired for constructing the Administrative & Academic Blocks and Residential Blocks of the Building respectively and M/s. Ananjiwala Consultants, Project Management Consultants for quality control and for supervising the construction activity. The work for air-conditioning of the building is done by M/s Voltas and M/s. Siemens is system integrator for IT and low voltage infrastructure. Civil construction of all the three blocks of the building i.e. Academic, Administrative and Residential Blocks has been completed. M/s Godrej who was awarded the contract for furnishing the building has also completed their contract. The contract for networking, surveillance, audio / video conferencing etc. awarded to M/s Siemens is nearing completion.